Inspecting your media regularly will prevent damaged media from breaking your tape drive. Here is a guide to show you how to inspect LTO media for damage and wear and prevent costly LTO Repairs. Inspect the cartridge packaging to check for any rough handling. When inspecting a cartridge, open only the cartridge door. Do not open any other part of the cartridge case. The upper and lower parts of the caseare held together with screws; separating them destroys the usefulness of the cartridge. While the door is open, check that the leader pin is properly seated. If the cartridge has been dropped, it is likely that the pin is dislodged inside the cartridge. It is recommended that you open the door and check if the pin is properly seated before each use. See Figure 1. Inspect the cartridge for damage before using or storing it. Inspect the back of the cartridge (the part that you load first into the tape load compartment) and ensure that there are no gaps in the seam of the cartridge case. If there are gaps in the seam, the leader pin may be dislodged. See Figure 2. If you suspect that the cartridge has been mishandled but it appears usable, copy any data onto a good cartridge immediately for possible data recovery. Discard the mishandled cartridge. Do not drop the cartridge. If the cartridge drops, slide the cartridge door back and ensure that the leader pin is properly seated in the pin-retaining spring clips. Do not handle tape that is outside the cartridge. Handling the tape can damage the tape surface or edges, which may interfere with the read orwrite reliability. Pulling on tape that is outside the cartridge can damage the tape and the brake mechanism in the cartridge. Do not stack more than six cartridges. Do not degauss a cartridge that you intend to reuse. Degaussing renders the tape unusable. Figure 1 displays a dropped tape which resulted in a dislodged leader pin. This cartridge if inserted into a drive could result in a stuck tape. Other damage could result in the leader pin falling out of the cartridge or getting dropped inside the tape housing. The following Figure displays a tape that has been dropped and the cartridge seam has split. 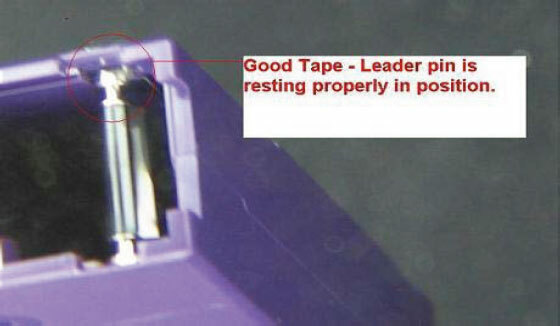 NOTE: Newer versions of LTO tapes have plastic-welded seams to prevent splitting; however, the tapes must be checked for leader pins that may have dropped inside the cassette housing. When you ship a cartridge, ship it in its original or better packaging. Always ship or store a cartridge in the vertical orientation and inside the jewel case to prevent damage to the tape edge. Use only a recommended shipping container that securely holds the cartridge in its jewel case during transportation. Never ship an LTO cartridge in a commercial shipping envelope. Always place it in a box or package. Place the cartridge in polyethylene plastic wrap or bags to protect it from dust, moisture, and other contaminants. Pack the cartridge snugly. Do not allow it to move around. Double-box the cartridge (place it inside a box, then place that box inside the shipping box) and add padding between the two boxes. Store LTO cartridges in their protective cases. Handle LTO cartridges with great care. Store the LTO cartridge vertically. Align LTO cartridges so the grooves interlock. Inspect LTO cartridges prior to each use. Unload LTO cartridges prior to turning off the drive. Allow a 24-hour conditioning period to the operating temperature and humidity before using new or stored cartridges. Eject LTO media before turning off the drive. Touch the media or leader with bare fingers. Use pens or pencils during cartridge inspection. Store the LTO cartridge horizontally. Store near magnetic fields (e.g. speakers, monitors, electric motors, power supplies, etc.). Use a LTO cartridge that fell from 3 ft or higher. Ship the LTO drive with LTO media loaded. If you have an LTO drive that you suspect has already been broken by a defective tape, please visit our LTO Repairs page here LTO Repairs or call us on 08450 666 222 and we can arrange to repair your broken LTO drive.